The photo gallery at the bottom of the page provides information about many of the snakes found in Illinois. Additionally, the Prairie Research Institute’s Illinois Natural History Survey has an Identification Key to help people figure out what species of snake they have found. If you don’t know what the species is, click on the text to work through the key. If you see a photo that looks like the species you saw, then you can click on the photo to get information about that particular species. Several of the non-venomous snake species are commonly misidentified as one of the four venomous species found in Illinois. Since a number of species of snakes vibrate their tails when they feel threatened, people sometimes mistakenly confuse them for rattlesnakes. The Eastern Foxsnake (Pantherophis vulpinus) is sometimes confused with the similarly looking Massasagua (Sistrurus catenatus). Learn how to distinguish between a Fox Snake and a Massasagua using this comparison chart. “Watermoccasin” is a general term used by the public to refer to all seven species of Illinois’ water snakes. Only one species of watersnake, the Cottonmouth, is venomous. In Illinois, it is found no farther north than Carbondale, in southern Illinois. Both non-venomous and venomous snakes benefit homeowners and gardeners by eating invertebrates and rodents. They should be left alone so they can provide this important pest service. Venomous snakes use their venom to kill birds and small mammals that they eat. Snake venom may cause tissue or nerve damage to humans, but a snake bite is usually not fatal to humans if proper medical treatment is received. There are only four species of venomous snakes native to Illinois. The Massasauga is listed as state endangered. The Timber Rattlesnake is listed as state threatened. 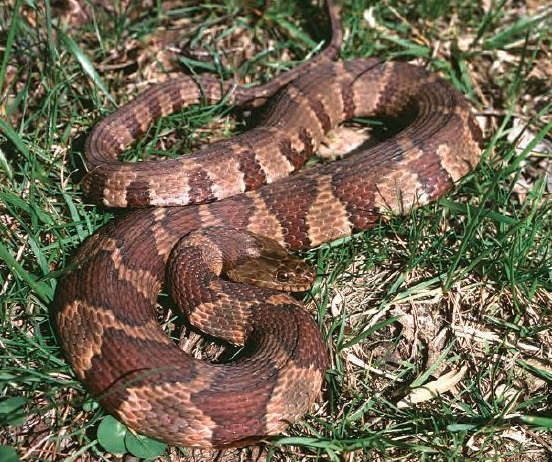 The Cottonmouth is found only in southern Illinois, and the Copperhead is found in the southern two-thirds of the state. None are aggressive towards people. Snakes can be safely removed alive from a site. The easiest way to capture a snake is to put on a pair of gloves, pick the snake up and release it outside. If you don’t want to come into contact with the snake, you can lay a trash container on its side in front of the snake and gently sweep it into the container. Set the container upright and secure the lid. The broom handle should keep you safely beyond the snake’s striking distance. Alternatively, the tines of a potato rake or a hoe can be carefully slipped under the center of a snake to quickly lift the snake into a container. Place a lid on the container and secure it. Release the snake outside as soon as possible. Snakes should be released onto the same property where they were found. The area should be located away from roads, provide sunlit areas that are not frequently mowed, and have areas of cover, such as tall grass, logs, or rocks, under which the snake can hide.